What Are the Different Types of Chorizo? “Chorizo” is somewhat of a loaded term because the word means different things to different people. From Portugal to Mexico to Spain and beyond, chorizo has incredible variance. Traditional Mexican chorizo is sold fresh— meaning raw and uncooked—and incorporates plenty of ancho chile and cumin into the ingredient list. Spanish chorizo, on the other hand, is dry cured and eaten more like a salumi, alongside cheese or even on its own, and has a strong presence of paprika. This recipe is like a mixture of the two. 1. Dice the pork into smallish 1-inch (2.5-cm) cubes. 2. In a large bowl, use your hands to mix together the pork, salt, ancho, paprika, cayenne, cumin, black pepper, garlic, and oregano until everything is equally distributed. Cover and refrigerate the chorizo mixture until you’re ready to grind. 4. Set up the grinder with a 3/16 (medium) die or, if you’re using a KitchenAid grinder attachment, start with the larger of the two dies for the first grind and then switch out to the second, smaller die for the second grind. Turn the grinder on and slowly add the pork through the feed tube. Be careful not to overload or overfill the grinder. Add the pork slowly, piece by piece, so the elbow doesn’t get overfilled or clogged. If you notice any smearing or clogging on the die, turn off the grinder and clean out the die. Also check your pork to make certain it’s still cold. If at any point the grinder is no longer cold, return it to the freezer until it’s thoroughly chilled and refrigerate the pork rather than leave it at room temperature. 5. After the first pass through the grinder, use your hands to completely combine the ingredients. Then pass it through the grinder a second time. (The more you grind the meat, the finer the texture will become and the firmer the resulting chorizo sausage will be.) After the second grind, use your hands to once again thoroughly mix the ingredients until the mixture becomes sticky and fully combined. (The sausage should stick to your hand when you turn it upside down.) Cover and refrigerate the chorizo mixture until chilled through, about 1 hour. 6. If you’re using natural casings, they’ll need to be soaked in room-temperature water for at least 1 hour before using. You’ll want to change the water several times and we’ve found that running water through them a few times before trying to put them on the extruder tube makes everything way easier. This also results in a softer and more pliable casing, which makes it easier to slide the casing onto the extruder and less likely to split when being filled. 8. Tie off one end of the sausage and twist, making a simple knot. Measure the desired length of the sausage and mark your workspace with either a piece of tape or line it with parchment and mark it with a pen or pencil to help ensure consistency in the length of all your links. You want to twist the links so that you get about 3 links to 1 pound (455 grams). In general, each sausage should be 5 to 6 inches [13 to 15 cm] long. Starting from the tied-off end of your sausage, use one hand to pinch it at the appropriate length. Then, keeping a hold on the pinched spot, slide your other hand down and pinch off the next length. Now, twist by picking up the sausage, holding onto the 2 pinched spots, and swinging it like a jump rope. Repeat until no sausage remains. When you get to the end, tie it off with a simple knot. When you get to the end, tie it off with a simple knot. You should have 15 to 20 links of homemade chorizo, each 4 to 6 inches in length. 10. Place the twisted links in a single layer on a baking sheet or plates, being careful that the links don’t touch one another. Refrigerate, uncovered, overnight to dry out the casings. 11. Snip the sausages at the seams to separate them into links (or, if desired, leave them as a whole rope of links like those you might have seen in cartoons!). Cover and refrigerate for up to several days until ready to cook. 12. To cook your homemade chorizo, you have a decision. You can grill the links over a charcoal or gas flame, sizzle them in a skillet, braise them in beer, toss them in the smoker, or cook them according to pretty much any recipe that calls for raw chorizo. Whatever approach you decide to take, you want the chorizo to be thoroughly cooked. We’d love to hear what you did with your chorizo so let us know in a comment below! Hog casings are available in both natural and synthetic form. Natural hog casings need to be soaked in warm water for at least 1 hour prior to use and the water should be changed often during this time. Synthetic, or collagen, casings should not be soaked prior to use. They have less elasticity than natural casings, so care should be taken to not overstuff them. This homemade chorizo recipe is a fantastic, spicier take on traditional Spanish chorizo! The instructions for how to make chorizo provided ample results, which means you'll have plenty to share with friends, and the 24-hour chill time left the refrigerator smelling amazing. Sausage making requires more time and additional pieces of kitchen gear than the average home cook may have. However, if all of those boxes are checked, this recipe is FANTASTIC! 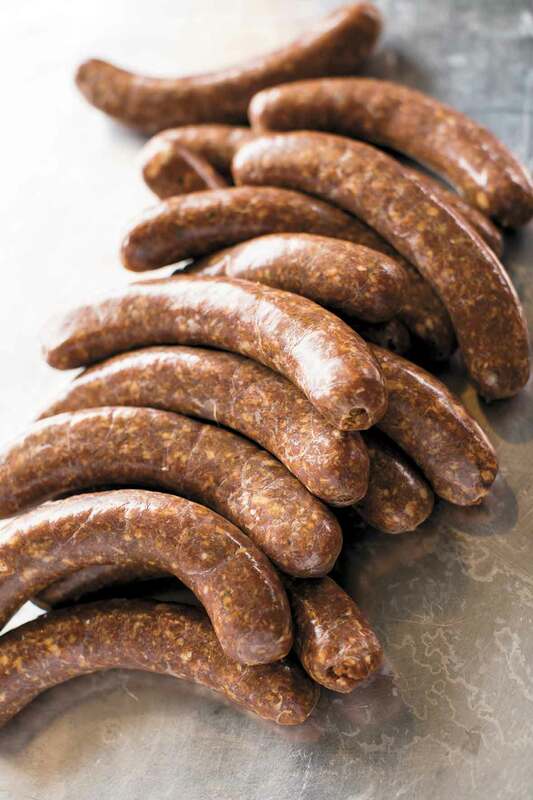 Spicy, garlicky, delicious, and great for first-time sausage makers. 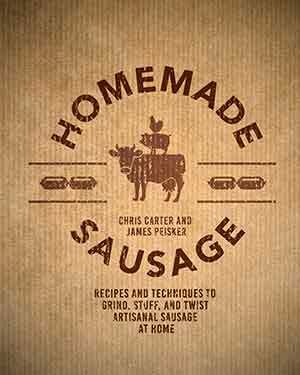 I will definitely add this one to my sausage-making arsenal. (That's a thing, right?) Be warned: This is a very time-intensive project, and stuffing sausage is WAY easier with 2 people. But this recipe is totally worth the work! I used a KitchenAid mixer with the meat grinder attachment for mincing the pork and the KitchenAid extruder attachment for stuffing the sausage. For Kitchen Aid users, I used the larger of the two dies for the first grind, then switched out to the second, smaller die for the second grind. When extruding, I used the larger of the two extruder tube attachments. Having 2 people for this process makes it SO MUCH EASIER! One person can pack the meat in the grinding tube, and the other can guide the casing and the sausage. An average home cook may not want to attempt this on their own. And rinsing the natural casings is a process that’s both disgusting and cool (coogusting? disgustool?) because the shape of the intestine is very apparent when the casing is filled with a bit of water. I was so excited to taste the final product that I had it twice the next day. At lunch I braised a link in a hoppy beer before serving it sliced with some grainy mustard, and for dinner I removed the casings and served small patties of chorizo over buttered brown rice with vinegared Swiss chard. In both meals, the chorizo was the star! There's nothing like homemade sausage and this homemade chorizo was snappy and picante! Like my husband said, "The Goldilocks of chorizo—not too hot, not too mild, just right." I served them with marinated eggplant to balance the heat. Our neighbors enjoyed theirs with eggs for breakfast and loved them. Remember to keep your meat cold as you work through the recipe and poke holes sparingly or the sausage could become dry when grilled. I used 5 pounds pork shoulder—2 kg pork shoulder plus .8 kg pork back fat. I put several pokes in the chorizo. Next time, I would only poke it once or maybe not at all. Don’t forget to lubricate the feeder tube with water. This is crucial when you learn how to make chorizo because you don't want the casings to dry out and tear. I keep a squeeze bottle handy and give a squirt every so often. I also squirt the surface where the stuffed sausage lays as it comes out of the feeder. How To Make Chorizo Recipe © 2015 James Peisker | Chris Carter. Photo © 2015 Andrea Behrends. All rights reserved. All recipes and photos used with permission of the publisher.